RESERVE ONLINE AND 1 CHILD FREE FOR EACH PAID ADULT. This promotion is only valid when booking one paying adult. Once your purchase is complete please contact us to register the child, This promotion is only valid up to January 31st 2019 Don't miss out! The Vallarta Adventure Signature Dolphin Swim Tour+ Free Majahuitas Beach allows you to have an unforgettable experience swimming with dolphins in Puerto Vallarta during your next Puerto Vallarta vacation. Find out more about the dolphins during a short orientation briefing, before heading to the water to meet your new dolphin friend. 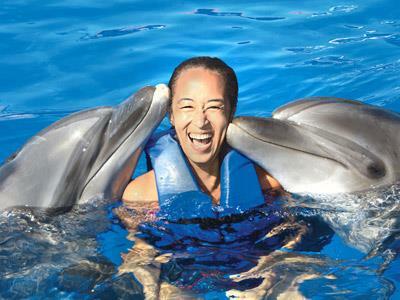 Enjoy different dolphin swim interactions that include a kiss, the belly ride, and the fin shake, and admire the incredible tricks and acrobatics they perform. Don't miss out on the Vallarta Adventure Signature Dolphin Swim Tour+ Free Majahuitas Beach and make your vacation in Puerto Vallarta truly unforgettable!